The ground has stands on either side of the pitch with a covered terrace at the southern Warwick Road End and a small open terrace at the northern Petteril End (also known as the Waterworks End). Curiously the relatively new Cumberland Building Society stand on the east side of the ground is not aligned with the pitch. When the stand was constructed there was a plan to move the pitch northwards to create more space to build a new stand at the Warwick Road End. The pitch hasn’t been moved nor has a new Warwick Road stand been built so the Cumberland Building Society stand runs 20 metres past the northern end of the pitch and stops 20 metres short at the southern end. Away fans are usually located in blocks 2 and 3 at the northern end of the Cumberland Building Society stand with block 1, past the end of the pitch, available where larger numbers of Away fans travel. Plastic seats are comfortable and views are free of pillars. Toilet blocks are large and easy to access under the stand. An excellent electronic display board is located on top of an Eddie Stobart truck behind the Petteril End terrace. Stobart is currently the Club’s main sponsor. Prior to each match, fans are likely to be entertained by Nixon’s Vixens cheerleading team. Located near the River Eden and its tributary the River Petteril, both the Warwick Road and the ground have experienced flooding. Since the last major Carlisle flood in January 2005, an alleviation scheme has been completed but before travelling, fans might check the game hasn’t been cancelled not just because of a mid winter frozen pitch but because of a waterlogged one! 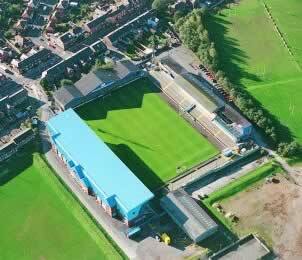 2nd September 2009 marks the one hundredth anniversary of the Cumbrians’ first match (against Newcastle) at Brunton Park, a major milestone for Carlisle United (a club known as Shaddongate United until 1904). Exit the M6 at junction 43, join the A69, and follow this into the city. Travel along Warwick Road for about a mile and you really cannot miss the stadium. From Carlisle station, cross Botchergate and proceed along the Crescent towards the junction with Warwick Road. Turn down Warwick Road (signposted A69) and continue for approximately 1 mile until you reach the entrance to Brunton Park, which is on the left side of the road. Visitors proceed to the Cumberland Building Society stand northern entrance. The ground is located about a mile east of the City Centre on the Warwick Road (A69). The Stoneyholme Municipal Golf Club is on the north of the ground, Carlisle Rugby Club to the west, Carlisle United’s training pitch to the east with housing along the Warwick Road. The nearest shops are in the town centre with a Tesco superstore at the junction of the Warwick Road with the M6. Travelling along the Warwick Road, continue past the ground for approximately 200 yards and turn right onto Victoria Place and then turn first right into St Aidans Road. The road turns sharp right near the Stonyholme Golf Club and you enter the car park soon after (charge £2). Away fans in wheelchairs are located at pitch level at one end of the highly exposed Petteril End, near to a corner flag and the Cumberland Building Society stand. There are two seats for carers. A disabled toilet is located under the stand with disabled parking nearby. The pub, the nearest watering hole to the ground, is on the Warwick Road. It offers Theakstons on hand pump, a range of lagers and basic pub food / meals, all at reasonable prices, plus Sky TV. It has a good matchday atmosphere but can get busy. Note that it may prohibit Away fans for certain games; this may be on the basis of their reputation! The Rugby Club, to the west of the ground on Warwick Road, has two bars with Theakstons on hand pump, lagers, Sky TV and cling film wrapped rolls on offer. It welcomes football fans on matchdays. At the back of the main car park, is a very pleasant Golf Club which welcomes Away fans on matchdays. It has a bar, a modest restaurant and Sky TV. The Breadwinner shop next to the Carlisle United Club Shop on Warwick Road sells baguettes, soup, pasta and hot drinks. In quality order, the Stoneyholme Golf Club, Lakeland Gate and Beehive pubs offer modest restaurant food. The Rugby Club sells simple rolls. The large Tesco superstore, on the Warwick Road near its junction with the M6, has a café. In the stadium, Away fans can buy inexpensive typical football fayre under the Cumberland Building Society stand but will not be impressed by the quality. If you are a registered user then you can login, and create your own personal review of Carlisle United Football Club - Brunton Park. These reviews can be private or public.